The 2017 Christmas ships are afloat! Everyone loves the Seattle tradition of the Christmas ships – concerts at the water’s edge, sung by choirs from the deck of a big floating party alight with Christmas decorations. Sponsored by Argosy Cruises, the ships cruise daily, visiting many Puget Sound locations to spread holiday cheer. We are delighted to help greet the celebration in our city parks, providing bonfires and other holiday activities at many of the stops. Here’s the schedule of stops in Seattle parks along Lake Washington, Puget Sound, and other local waterways. Come revel with us! Dress warm, bring umbrellas, and join with your community in this heartwarming activity. For more details and the full Christmas ship schedule, including stops outside of Seattle city limits, please visit the Argosy Cruises website. Many Seattle Parks and Recreation facilities will be closed Monday, May 25, in observance of Memorial Day. 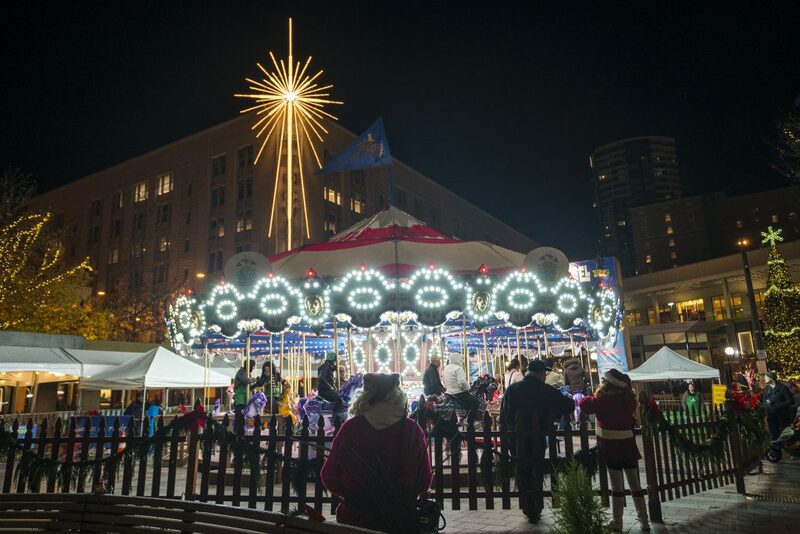 Seattle Parks and Recreation, the Green Lake Community Center Advisory Council with the help of our community partners, Green Lake Masonic Lodge #149, PCC Natural Markets, and Green Lake Windermere Real Estate help continue a Seattle tradition with the 37th annual Pathway of Lights. The event is free and will take place from 4:30 – 7:30 p.m. on Saturday, December 14, 2013 (second Saturday of every year) rain or shine. Volunteers are needed to help place and light the thousands of luminaria, and to clean up after the event. Individuals, businesses, community organizations and school and scout groups are welcome to participate. Setup takes place from 2:30–4:30 p.m., and the lighting of the candles takes place at 4:30 p.m. Cleanup is from 7:30- 9 p.m.
For more information, please contact Jeff Skinner at 206-684-0780or by e-mail at jeff.skinner@seattle.gov. The Volunteer Park Conservatory and the Volunteer Park Trust are looking for choral and other musical groups to perform at the Volunteer Park Conservatory’s December 13 holiday celebration. The free celebration, co-hosted by Friends of the Conservatory, Volunteer Park Trust, Seattle Asian Art Museum and Seattle Parks and Recreation, will be an opportunity for visitors to see the Conservatory dressed up it its holiday best. The sponsors are looking for choral and musical groups to perform for about 30 minutes between 6 and 7:30 p.m. Interested groups can contact foc@volunteerparkconservatory.org or brooks@brookskolbllc.com. The Friends of the Conservatory is a nonprofit organization formed in 1980 to work with Seattle Parks and Recreation to support the Conservatory’s mission through educational activities, fund raising, and public events. For more information, please see http://www.volunteerparkconservatory.org/. The Volunteer Park Trust is a newly formed organization working with Parks and the Seattle Parks Foundation to restore, revitalize and protect Seattle’s world famous historic, Olmsted designed park. For more information, please go to http://volunteerparktrust.org/. Seattle Parks and Recreation and its partner organization, the Associated Recreation Council (ARC), will hold holiday parties at neighborhood community centers all over the city in December, and invite donations of toys and funds for needy area families. •	Making a cash donation by US Postal Service to Associated Recreation Council, 100 Dexter Ave. N, Seattle, WA 98109, Attn: Dewey Potter. Parks and ARC staff will distribute the toys and funds collected at these sites to needy families. The toy drive will take place from November 30 through December 17, 2009. A list of community centers is online at http://www.seattle.gov/parks/centers.asp. For more information, please call Dewey Potter at 206-684-7241 or Robert Stowers at 206-684-0796.